Meet Pagans and fellow free thinkers. 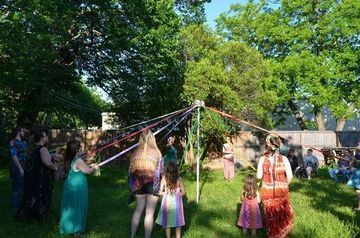 The folks already here represent many traditions and interests, and they take pride in supporting individual spiritual pathwork in a warm and inclusive environment. This is not a coven or a Pagan community center, but it functions somewhat like that. We are a Unitarian Universalist fellowship that’s been chartered since 1966, and we became Earth-Centered by vote on Samhain, October 31, 1999. We haven’t looked back since. Folks coming here are solitaries, seekers, elders, active coven members, eclectic, tradition-specific, UUs, you name it. Some don't even want a label. You are welcome at any and all of our events. Try out the ones that interest you, and learn about our fellowship and all the other things we have to offer. If you need transportation assistance, contact us and we might be able to help.